It all started on Wednesday morning when I tweeted a link to a Daily Mail article. The motivation behind the change was reasonable. Not expecting girls who do not believe in God to promise to love Him is fair and appropriate, especially as the Guides have made clear for some time that they no longer see themselves as a Christian organisation. However the vague and morally relativist true to myself along with the threat of expulsion of groups who have refused to accept this new promise or wanted to use any additional reference to God, has been met with disappointment and scorn, from a range of commentators beyond those with a religious bias. According to the Daily Mail article, a unit in Newcastle who were due to be removed imminently from the organisation for keeping the old promise had won a reprieve after they were told no further action would be taken and that a compromise found. Taking such drastic action over a core promise that has been completely acceptable and loved since the Girl Guides were founded in 1910 appeared more than a little harsh. Today the Daily Mail has printed a misleading and inaccurate piece suggesting that we have changed our position on the Promise and are considering offering an alternative. This is not the case. While Girlguiding remains committed to ensuring all girls have the opportunity to be involved in guiding, we are also fully committed to one Promise for all and the wording that resulted from the consultation. The motion was subsequently passed. Of all the motions debated at this week’s Synod, it was the one that had by far the least clout. It was curious that it was even being discussed. It didn’t have the power to change anything as the Church of England has no say over what the Girl Guides do. It was just a public statement of disappointment over the way God had been completely dropped from the promise. And yet by the end of the day it had had more of an immediate effect than anything else that was discussed over those few days. “Girlguiding has taken on board the view of a minority of our members who struggle with the new wording and suggested those members can provide the context of their own belief if they wish before making our promise. This was remarkably similar to the agreement that the Daily Mail had reported at the start of the day. The irony of his words is that not so long ago the NSS was putting intense pressure on the Scouts to change their own promise so that any mention of God should be optional. At least when the Scouts did decide to address the desire for a godless pledge, they had the sense to stick with their original promise as their official one and add an extra version for those wanting to remove the religious element. In doing so they remained true to the spirit of Scouting whilst removing barriers that had stopped some joining. In contrast the Girl Guides have made life difficult for themselves by adopting an all-inclusive promise that promises very little. If the nature of Girl Guiding is now to be true to yourself then maybe it would have been good for the leadership to have considered what that means for themselves. To flip-flop over their promise in the space of a few hours and come out of it making the Daily Mail piece look as though it has more integrity than their organisation is quite an achievement for all of the wrong reasons. What they have decided to do – if actually the case – is a welcome and sensible decision, but with a bit more forethought back in June and a slightly less hardline attitude they could have saved themselves a lot of grief. Perhaps it says something about what being true to yourself should mean that it took the Church of England’s General Synod wanting to allow others to affirm their beliefs to find a solution for an organisation that in its desire to separate itself from God is rather less sure about what it should be encouraging its members to believe. ‹ Valentine’s special: Have we cheapened the essence of love? Strong stuff! and puts into perspective the NSS claim of 22 January “Church of England intensifies its bullying of the Girlguides over promise”. It always seemed likely that Synod would approve the motion, even as proposed, but prefacing the promise with “In the presence of God I make my Guide Promise” does seem to have a certain eppur si muove quality. Personally, I think they’re wrong to remove the reference to God, but then I’m not a Girl Guide! Rightly or wrongly, the phrase “to be true to myself” smacks too much of the modern “self” orientated world. The uniformed organisations should be outward looking in purpose and their promise should reflect THAT. The Guide organisation was wrong to insist on this change and alienate girls who wish to express their faith in a positive way. Sadly, it’s all too late now, of course. The whole thing is self-contradictory. What if being true to yourself and developing your beliefs are meaningless apart from God revealed in Jesus Christ – as must surely be the case for any true Christian? Then enforcing this secular promise undermines the very values it purports to promote. This seems therefore more about being true to postmodernism and developing the NSS’s beliefs whilst giving the young people involved very little say in the matter. The compromise suggested by the Guides and Synod does little to change that. 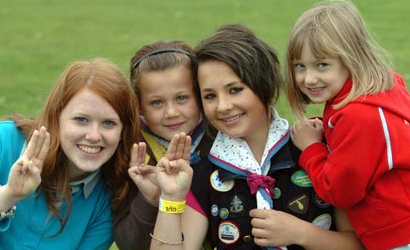 It’s not true to say GirlGuiding “no longer” sees itself as a Christian organisation – it is not and never have been. To those who say the current wording is selfish – do bear in mind that the Guide Law is unchanged – as each member promises to keep that Law, so clear guidelines are set within which the member’s beliefs must fit.